St. Ann’s Catholic School – …………. ''AND LET THE FUN BEGIN''……………..
On Saturday, Tammy text me if I could keep Cassidy over night. She had to work this weekend. I said sure of course. I went out and mowed the grass so it would be done for the weekend. Tammy dropped her off and OMG. She was in a BAD MOOD. Mom was talking about taking her I Pad AWAY…..This this is serious business to an 11 year old. So now,,,,,what to do….what to do…..We went up to Scott’s bar, and eat sandwiches…..Nobody was in their on Sat. afternoon, So how about a game of pool. Well that seemed to cheer her up. …..Making progress…..lol….So came back home and checked FB. My friend in Toluca was having a garage sale. So lets make a short trip and visit. Its only about a half hour drive. 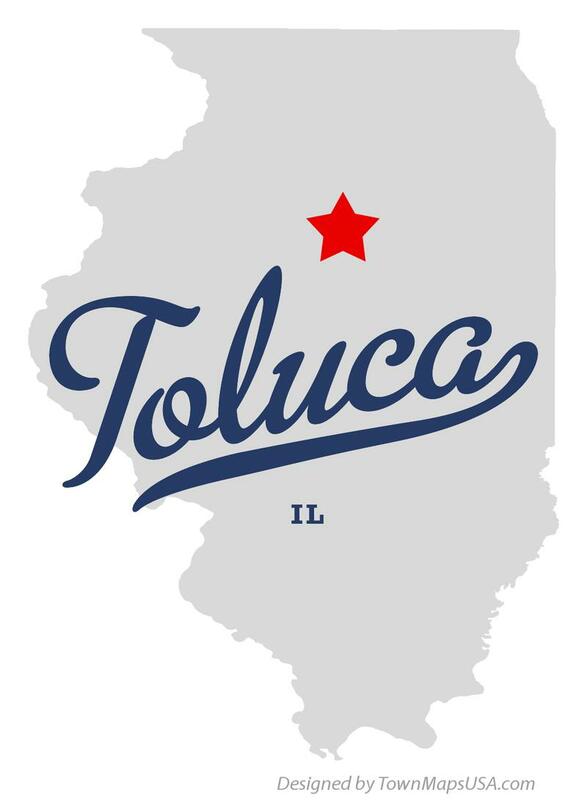 Toluca is the town where I grew up. We moved their when I was 5. I went to school and graduated from Toluca High School. Graduating class of 35 students…..lol….The High School was a consolidation of 2 grade schools in town, Toluca Public School and St. Ann’s Catholic School. 1992 was the last High School graduating class, and then area schools consolidated to form the Fieldcrest School District. It comprised the schools of Toluca, Wenona, and Minonk, Dana, Rutland. It was sad but that is the way it goes these days. Its all about money and what a small school district can offer for education. Toluca is also famous for “Mona’s” and “Capponi’s” Italian Restaurants’. They were both started around 1933 but Capponi’s was bought by the Mona Bernardi Family in 1965. They still both serve the same traditional recipes of chicken ,Italian pasta of spaghetti, ravioli and Lasagna from when they were owned separately. They are famous through out the state, also selling their VO salad dressing and pasta products in grocery stores. We went to Gabi’s and another friend, Janet came over. We had a nice visit and we were talking about old times. The subject of the “Jumbo” came up. As kids we all use to go over and explore. 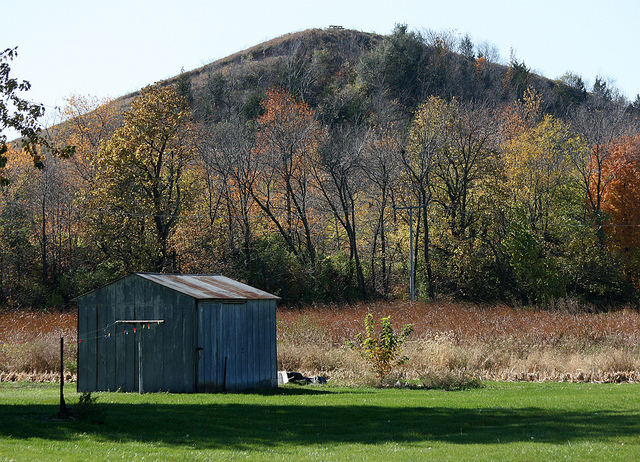 It was were the old coal mines had been, and when we were kids it was all grown up in weeds and trees. You had to cross the tracks and then climb over the old fence that was ment to keep people out. lol…….Fight your way through weeds and trees. A few buildings were their but falling disarray. I remember an old shed full of bales of hay. I would climb and play in them. 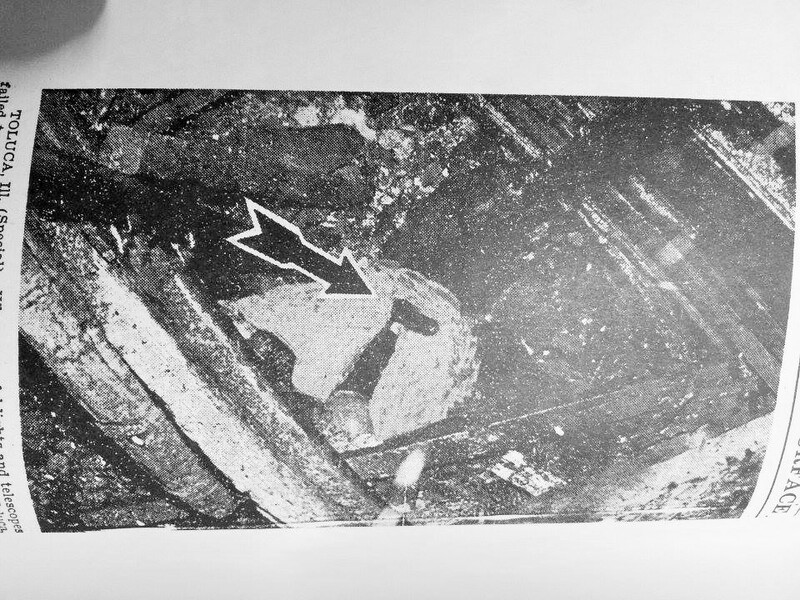 The old mine shaft was still their but had wire and some wood post around it. It was really not safe at all. You could throw things into the deep dark hole. Its a wonder no kids ever got hurt or killed their. But the biggest attraction was the 2 “Jumbos”. Their were 2 mountains made out of slag. Slag is like a shale rock, which is left after they take out the coal from mining. They ran rail cars and dumped it out to eventually form 2 mountains. Many small towns in the area have them. You always knew which towns had coal mines in their past. We would climb the first one closest to town. The paths were all washed out from years and years of rain, snow and the natural weathering of the elements. Once you got to the top, you would look around and just be in “AWE”…..It was an Unbelievable sight. Especially to a kid. I drove over to the Jumbo crossing over the tracks at the east end of town and down the road paralleling the tracks. The tracks are now owned by BNSF Railway. It is not the main passenger line anymore but it is still the main freight line to Chicago. We pulled up to the parking area. It is now a park. 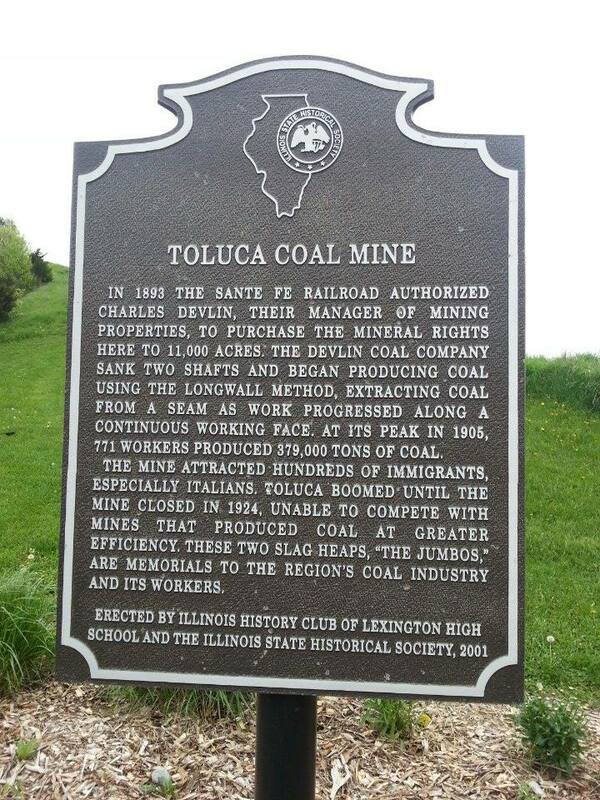 “Toluca Coal Mine Park”. Around the year 2000, the town formed an Association for the clean up and preservation of the property. It is now a park to be use for hiking, picnicking and a pond for fishing. They also hold some other town events in the park. A nice fence surrounds the edge and a plaque about the coal mines is posted as well as a refurbished coal car sitting on a rail. It was used to extract coal from the coal mines. As we walked through the gate I noticed it has a beautiful natural park like atmosphere. Trees, blowing grasses in the breeze and that wonderful feeling of nature. Over to the side was a huge concrete circle. This was the opening to one of the mine shafts. It is now filled in and no longer a danger. A huge pulley was housed inside this concrete. It would turn and pull the buckets or maybe even people up the shaft. Cassidy was actually starting to have fun. Next we walked further, and seen the nice trail up the Jumbo. I had sandals on but Cassidy headed up the trail to the top. lol and she ran……Great to be a kid……She made it to the top and looked like a little dot. But acoustics were great, we could still shout to one another and hear our voices. Gabi and I walked further and found the old pool. Back in 1924, after the mine had closed, a huge concrete community pool was constructed. When I was a kid, in the 60s, it was still here, but so broken with age. The walls were still intact but people were throwing trash in it. Old car parts….Stove and Refrigerators…..tree and leave debris…..Plus mother nature was allowing trees and bushes to grow up in the cracks. Now it has been filled in and planted with grass. But the foundation is still here. It is so cool to still see it. After Cassidy came down, we sat and talked abit. The dandelions were done blooming and had their little feathery heads that blow in the wind. Cassidy had fun collecting a bouquet and then blowing them and watching them fly in the wind. 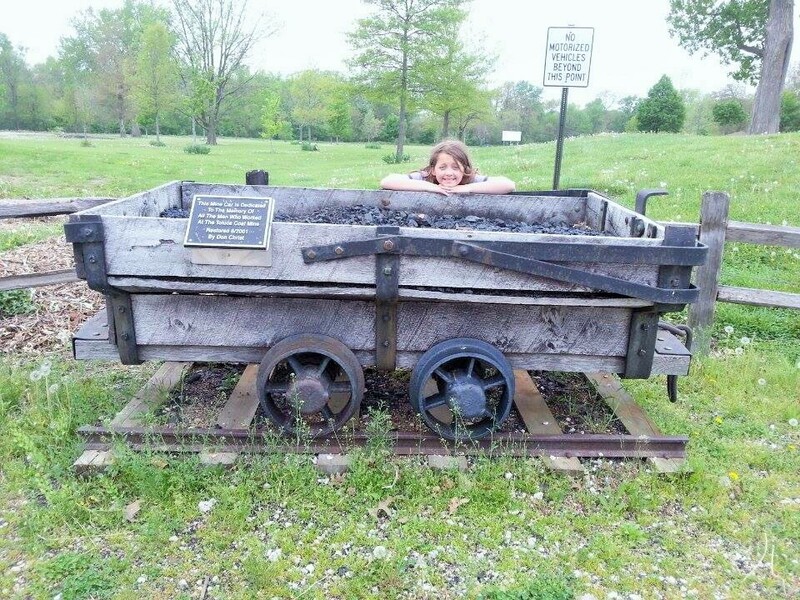 We sat for awhile and talked about the history of the mine.Gabi found a peace of coal and shale for Cassidy to take home. She was actually very interested. 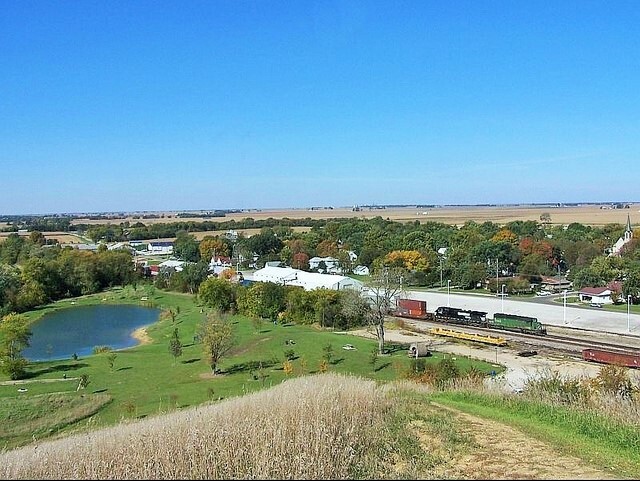 The Devlin Coal Company opened the mine in 1892, because it was next to the Santa Fe RR. It eventually had 3 shafts some extending out 1 to 2 miles from the shaft opening. Its average output was 1,000 tons a day. In 1905, 771 miners produced 379,000 tons of coal. The town grew very fast, bringing in Italians, Polish and many other immigrants. It grew fast to around 3,000 people. I heard often as a kid, that the town supported over 30 taverns. Can you even imagine pay day?….lol….Party time…..The closed in 1924, due to rising wages, costs and newer mines elsewhere. The coal veins were getting to far from the shaft openings. It just wasn’t efficient anymore. 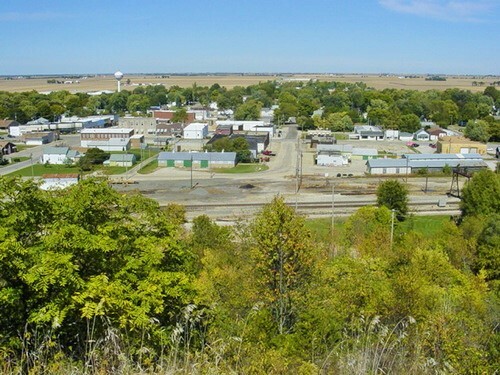 Today the town has a population of between 1400-1500. Now one of the story’s I heard as a kid was of a missing man. In 1939, 73 year old former miner, Dominick Valesano had been missing for 2 weeks. He was thought to have fallen or jumped down the 410 foot vertical shaft. Due to the presence of “Black Damp” gas. No one would go down to search. Two brothers and a friend used their cheap brownie type camera and made a power device to power a flash bulb that had been attached to the brownie camera. They lowered it down the 410 foot shaft and took manual flash pictures. The weight of the camera and light was over 10 lbs. and the addition of over 400 feet of wire brought the weight to over 300 lbs. It took all the combined strength of the 3 to pull it back up. When the pictures were developed, their was the view of the lower part of the body. The top half was hidden by a beam. There were efforts to bring the body up with a grappling hook, but eventually men had to go down with gas masks. 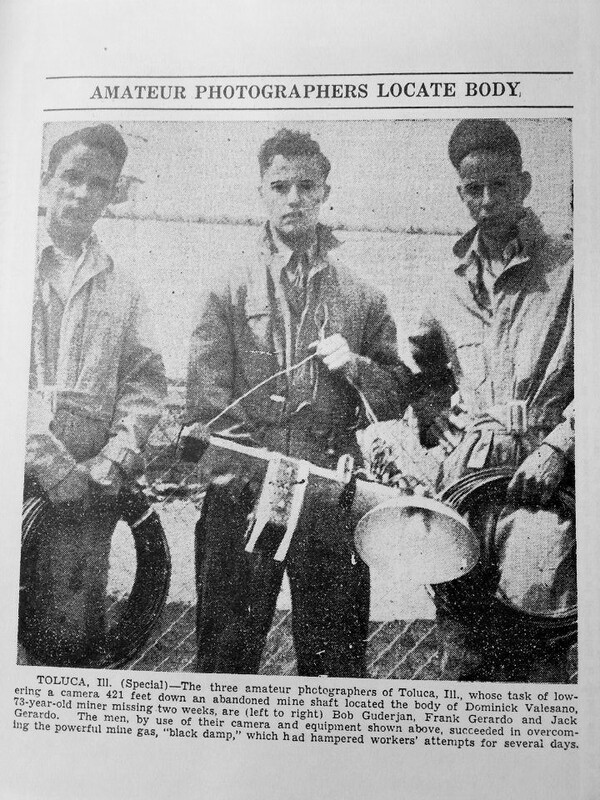 The story of the boys successful operation with amazing results made the national headlines in 1939.